Today Ken Schwaber and Jeff Sutherland, the creators of Scrum delivered a webinar on their latest update to the Scrum Guide. The update was a simple one, adding the 5 values of Scrum to the Guide. And when I say simple I mean simple in terms of the text changes to the Scrum Guide, not simple in terms of what it means to the community and people practicing Scrum. In fact, far from it. By making the Scrum values explicit and transparent it may call your teams working approach into question. But ultimately these values provide value (pun intended). 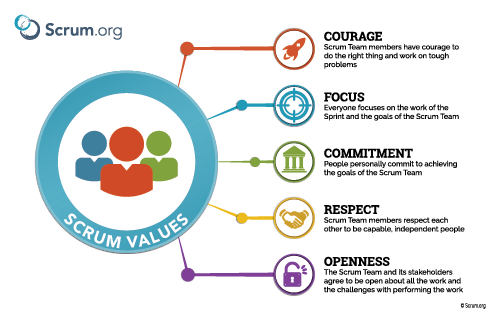 In fact, I would go as far as to say that these values amplify the power of Scrum by providing a compass for decision making and team dynamics. The Scrum values help teams adopt Scrum and deliver amazing software for their customers. And, they also create a great place to work. Which, in this hyper competitive employment market is not a bad thing either. The diagram depicts the 5 values; Courage, Commitment, Focus, Openness, and Respect. In this blog I do not want to repeat in detail a definition of each. Gunther Verheyen did a fantastic job describing these values in his blog. Instead I want to focus on why these values that may appear obvious, are actually really difficult to adopt in most ‘traditional’ organizations. I also want to describe some very simple, regular practices that can help you and your team use the values for your day-to-day work. To remind everyone what the values are in the context of the Scrum Guide. These values sound easy? Well, there are many misunderstandings and common problems when applying these values. Here are some examples. Committing to something that you don’t understand because you are told to by your boss.Committing yourself to the team and Sprint Goal. Focusing on keeping the customer happyBeing focused on the sprint and its goal. Thinking you are helping the team by being a heroHelping people to learn the things that you are good at and not judging the things that others aren’t good at. Even after the decision has been made continuing to push backBeing transparent, but willing to change even if that means accepting that you are wrong, or that your opinion is not the direction that the team is going. Put the values on a wall and have each team member write up how they are going to demonstrate the value in their working day. Add a ‘values moment’ to your retrospective. This gives everyone an opportunity to inspect and adapt on their values. Introduce a ‘values’ prize. Not a serious prize, but a fun prize that sometimes can be delivered to two people or the whole team when a value has been demonstrated and everyone is aware of it. The ‘whoops we dropped the value’ prize provides a way of demonstrating courage, but also highlighting when we missed a value. Of course, this prize could end up being a very negative thing so it should always be delivered in a fun way without negative implications. Getting external managers or stakeholders to demonstrate to the team a value and what it means to them.